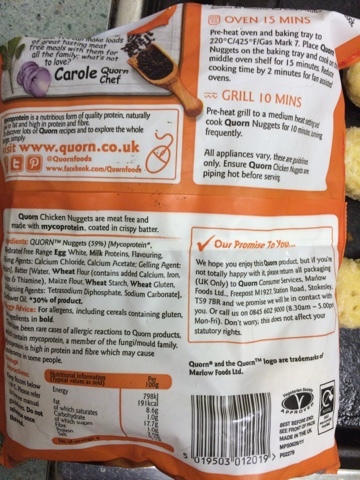 Meat free products with meat in its name is often a confusing idea. It's not for lifelong veggies - who thinks that meatballs and chicken nuggets are the must have items that you are missing out on? And it's unlikely to satisfy those that are true meat freaks - they aren't indistinguishable - and they haven't performed that well in taste tests. I guess that they are to try and tempt people over, and for people who are tempted to move back. 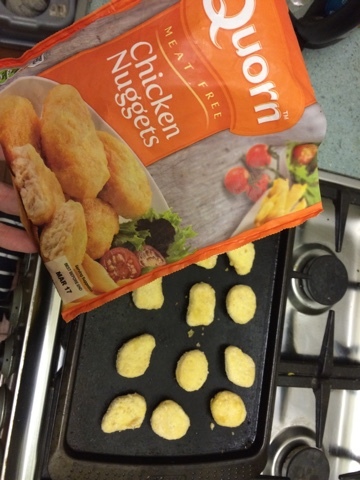 I thought it would be fun to try the Chicken Nuggets as they were a staple food as a child, every Friday without fail (until we discovered pizza!). Here you see that they even made a few shapes so that you can tend they are real. Reassuring for me, and a bit freaky for my veggie partner who has never eaten the chicken variety. The ingredients are fairly un exciting, it's just soft tasty Quorn hidden in some batter. Much better than mechanically reclaimed bird meat in theory. Not suitable for all diets, but petty healthy really. 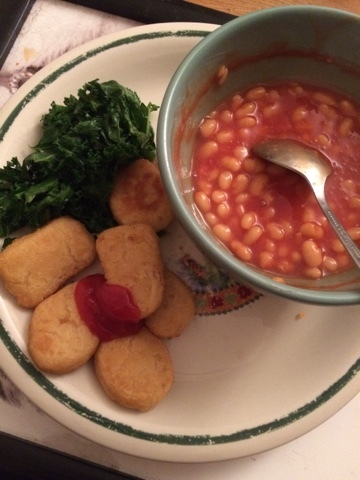 We had ours with kale, and Heinz Baked Beans (despite all the sugar) and Heinz Ketchup (so more sugar there then). To be honest, I'd not expected much from these, but they do actually work. The batter solves the great veggie problem that there isn't really and sizzle in veggie things. 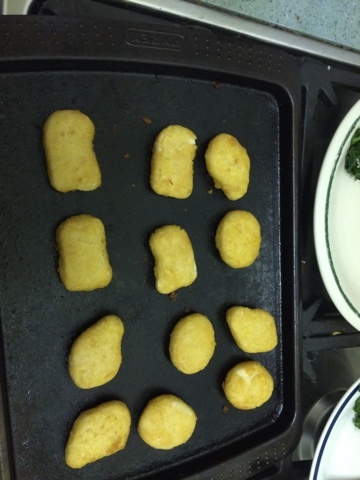 This means that they have a varied texture and work as nuggets. I'm tempted to try these on my sister who is an aficionado of the bird bites, and see if she can tell. The good ketchup and sides helped a lot. We had the rest of the bag with waffles which was proper old school. My veggie partner said that if I bought them again she'd happily have them but it really took some coaxing to have that first bite. Another victory for Quorn.